In a pot combine together oxtail and water, bring it to a boil then skim off the scum. Add the spices on the muslin cloth on the pot and simmer the stock for 4 hours. Season with fish sauce then continue to simmer until ready. Cook rice noodles according to packet instructions. Once cooked set it aside. Place bean sprouts and lemon on a serving dish. 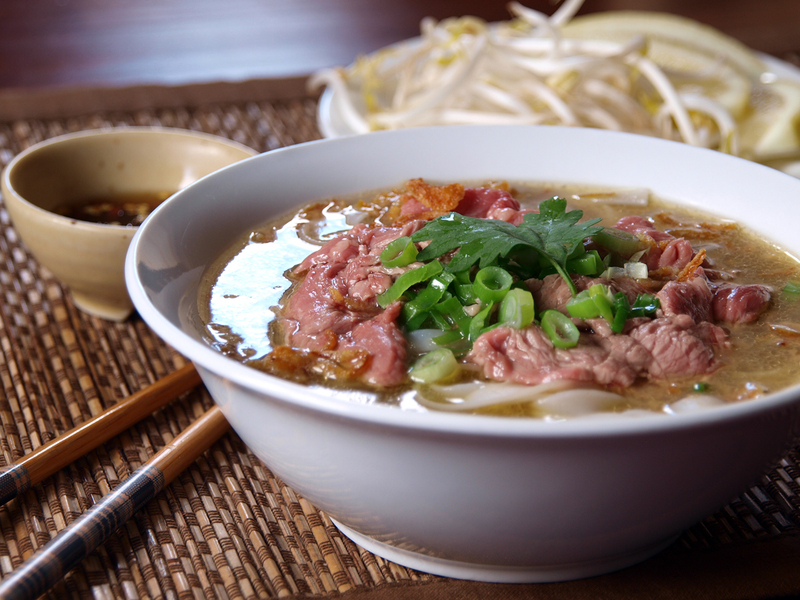 Place cooked noodles, raw beef slices, onion slices, spring onions, coriander and deep fried shallots on a bowl. Pour the hot broth on the bowl then serve immediately together with bean sprouts, lemon, fish sauce, hoisin sauce and chillies. You can use the meat from the ox tail, just separate them out and discard the bones.